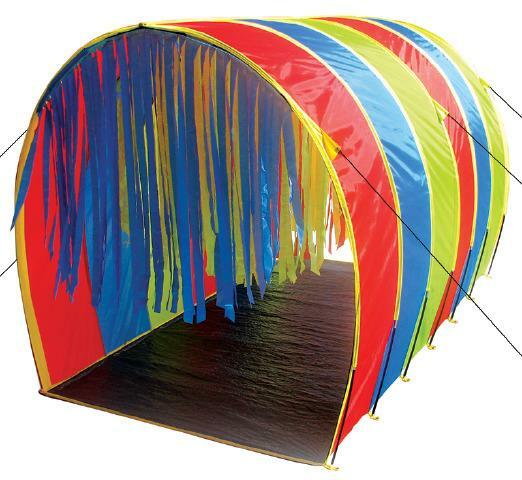 This Giant Tunnel is a great sensory item with Velcro streamers coming down through out the inside. Specifically made for kids to walk through or for children in wheelchairs. This tunnel promotes a child's imagination while developing their sensory skills and muscle strength. This super fun tunnel teaches kids cooperative interaction. Flame retardant, meets Big Fun in a Big Tent! Excellent ventilation and also provides a full view of your children as they play. Collapses down for easy storage. CPAI-84 & ASTM F963 safety standards. Recommended ages 3 and up. THIS ITEM IS CURRENTLY ON BACK ORDER AND SHOULD BE AVAILABLE THE END OF AUGUST. Dimensions: L: 9' x W: 5'6" X H: 6'6"